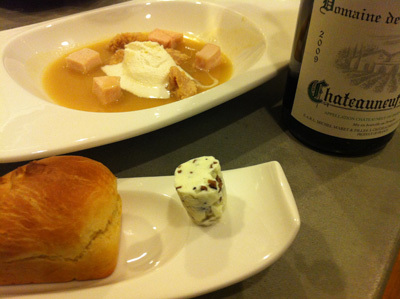 This recipe is adapted from Thomas Keller’s Under Pressure. The original recipe is much more involved and intricate, but I’ve managed to simplify it without losing any of the wow factor. In addition to using the modernist technique of sous vide, this dish also features the employment of Transglutaminase (aka meat glue). This ingredient has gotten a bad rap in the past as some unscrupulous meat processors have used it to ‘fake’ whole intact cuts of meat. 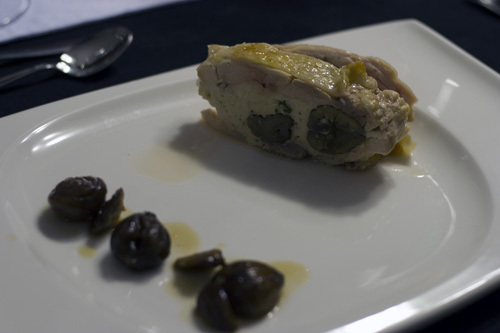 Here, though, it’s used to create a really interesting layered chicken dish. You can buy jarred chestnuts that have already been peeled, which is much easier than purchasing fresh and peeling them yourself. Enjoy! 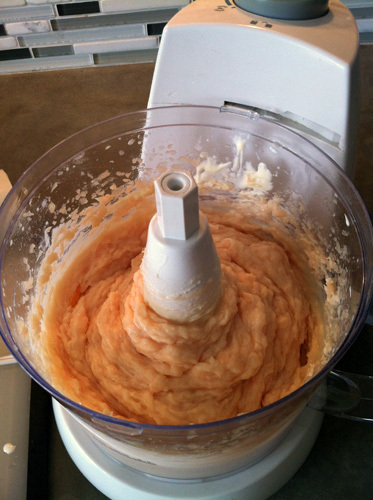 Combine the breast meat, 2g Kosher salt, and 1g transglutaminase in a food processor and process until it resembles a thick paste. With the processor running, add the chicken stock and continue to pulse until the mixture is wet and shiny. With the processor running, add the crème fraiche and mix thoroughly. 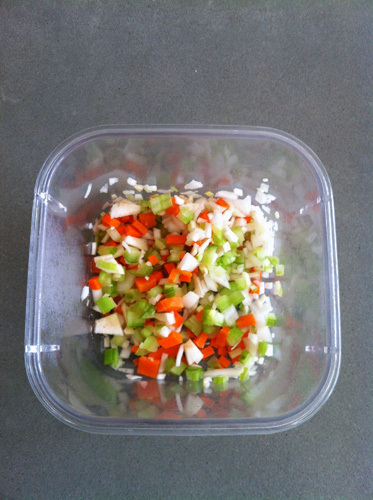 Move the mixture to a bowl and add a couple dashes of white pepper, the carrots, celery, leeks, chives, and chestnuts. Stir until well mixed. If you chicken legs are not deboned, do that now while ensuring you leave the skin completely intact. Check out this video to see how it’s done. 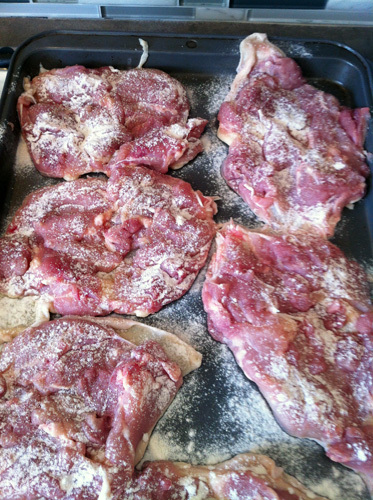 Lay out all your pieces of chicken leg skin side down and sprinkle all of them with Kosher salt and white pepper. Using a small sifter, sprinkle enough transglutaminase over each piece so that it looks like it’s been dusted with powdered sugar. 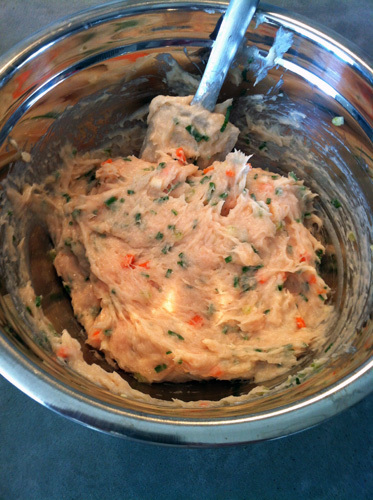 Spread the chicken mousse over three of the chicken pieces. 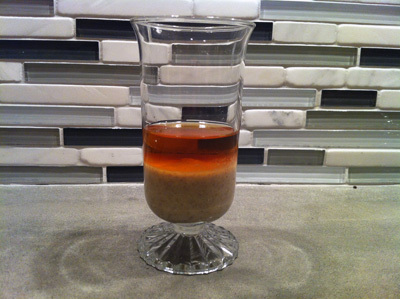 The mousse layer should be about one inch thick and taper toward the edges. Top each mousse covered leg with one of the non moussed legs keeping the skin side up. Refrigerate for 6 hours to allow the transglutaminase in the mousse and on the legs to bond thoroughly. Place each chicken leg sandwich in its own sous vide bag and vacuum seal. Cook sous vide for one hour. 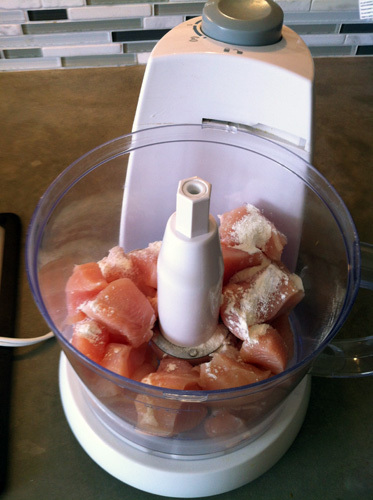 Once finished cooking, remove the chicken from the bags and pat dry with paper towels. Melt enough clarified butter to cover the bottom in a nonstick pan. One it is hot, add the chicken and cook until the first side is crispy and golden brown (~3 minutes). Flip and brown the remaining side. Trim the edges and cut the chicken into thick slices. Combine the honey and butter into a small sauce pot and warm, stirring to combine. Add the chestnuts and just enough chicken sauce to cover them. Cook over medium heat for 30 minutes, glazing the chestnuts with the sauce from time to time.